Not completely wrong, but wrong enough that I’d like to take another crack at it. Because on further reflection (and with an additional year of reading and writing countless hero messages), I believe the original article tried to make the hero message do too much, carry too much weight. As a reminder, a “hero message” is the one- or two-sentence statement that appears atop your website’s homepage. My hope was to provide a loose formula for crafting a website hero message that works—and at the end of this article, there’s a revised one—but a year ago, I was too ambitious. When it comes to marketing your organization online, words are still your most powerful tool—but they can do only so much, especially when confined to such a small, powerful space. A couple of months ago, a diner opened in a tiny strip mall down the street from me. I knew it was a diner because the giant sign above its doors read, simply, “DINER.” When I went inside, I learned the place’s official name is “Phoebe’s Diner.” I admired the owners’ decision to forego the “Phoebe” on the outdoor sign, choosing instead to use all of the available space to advertise what they are: a diner. That’s what mattered to the people driving by. Imagine if the diner had chosen, instead, to put up a sign that read only “Phoebe’s.” Passersby wouldn’t know what Phoebe’s did, made, or sold. Was it a restaurant, a candle shop, a wedding planner? Websites are meant to be problem-solving tools, not talent shows. Surely you can think of examples of brick-and-mortars in your neighborhood whose external signage doesn’t clarify what the business does. What is “NexCom”? How about “Common Interest”? What do they sell at “The Noble Cow” anyway? First and foremost, an effective website hero message is no different than the sign outside that diner: It should explain what you are and do. But unlike a physical sign, a hero message can go even further—helping to explain who you do it for, the value you add to the world, and/or why anyone should care. I originally recommended that your hero message include mention of why your organization exists. I now think this was sub-par advice. These are perfectly fine answers—but not to the question I asked. Borrowing from leadership guru Simon Sinek’s pioneering work in shaping brands, the question of why your organization exists aims to the guts of your identity. Most organizations, Sinek points out, are very adept at explaining what they do (e.g., “Provide a great education”) or how they do it (e.g., “By delivering one-on-one student attention from world-class professors”), but they usually can’t adequately answer why they do it. Knowing your “why” is important to your organization. But it doesn’t have to be included in your website’s hero message because doing so tends to result in a clumsy, overly wordy hero statement. An ideal hero message shouldn’t contain more than 8 words because that’s the point at which the average reader begins to forget it. Your why statement absolutely can be shoehorned into your hero message, and if it’s compact and clearly articulated, the why statement probably should. But it absolutely does not need to be present in your hero message for your hero message to be good. Do you even need a hero message? If you’re reading this article, probably. If you’re Wal-Mart or ExxonMobil or Harvard University, probably not. The first article implied—though it didn’t explicitly say—that every organization needs a hero message on their website. After all, if your organization is a global brand with wide and deep awareness, a hero message can be a lot more traditionally creative or pithy. You can assume most everyone visiting your website knows of you and, therefore, you can get away with not clearly articulating your value proposition or describing your product/service. You can play around. But if you’re not widely known—or if your product/service is potentially complex and easily misinterpreted—then a great hero message is a must. Quick: What does this company do? 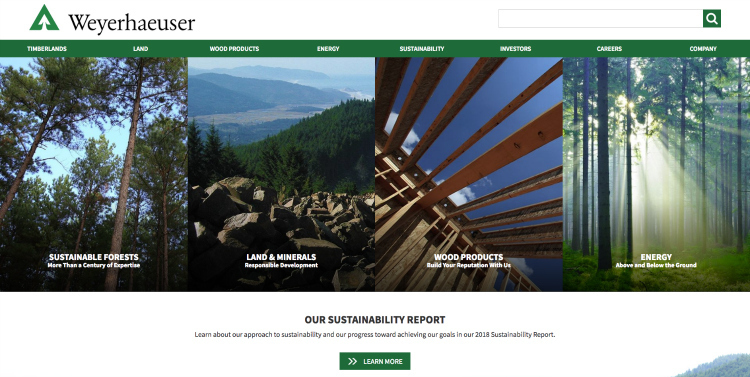 Even huge companies (Weyerhaeuser is on the Fortune 500 list) can sometimes fall under the assumption that their online visitors know, exactly, what they do. They don’t. Unless your brand is already on the tip of the tongue of every customer and potential customer, get a hero message, and quick. 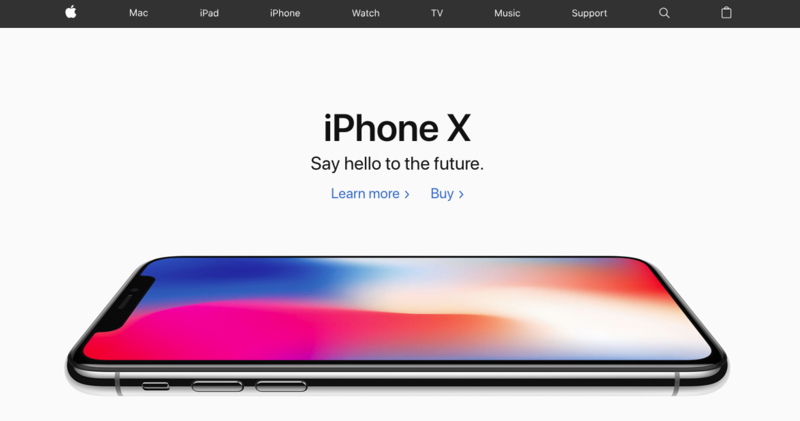 If the big text on your homepage is your “hero” message, the second line of text—optional, often smaller in size and emphasis, and appearing near though not necessarily flush against the hero message—should be called the “sidekick,” shouldn’t it? Using a sidekick message is increasingly popular as it allows you to have your marketing cake and eat it too. It lets you be both clever and novel (with the hero message) and descriptive and explicit (with the sidekick). Admittedly, the hero message—“Innovation Starts in the Cloud”—is pretty nebulous, and it doesn’t say much about what this company, SADA, does. It hints at it, sure—they do something technological in the cloud—but not much more. Thoughts on content delivered to your inbox. 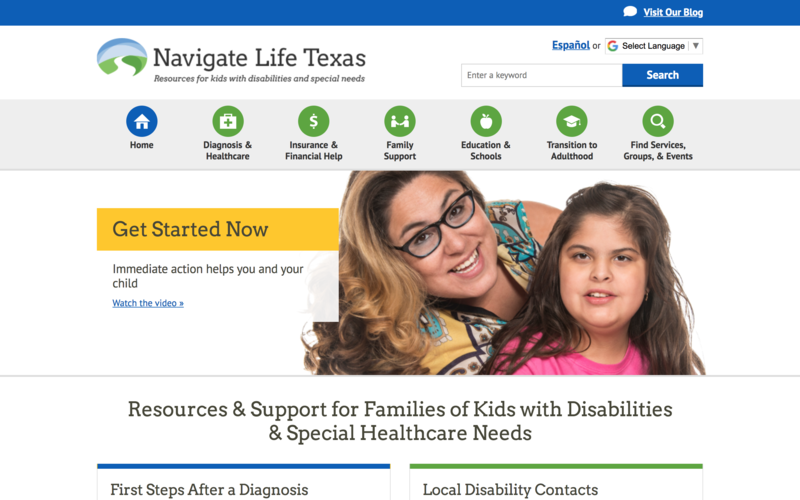 Closer to home for us at Mighty Citizen is our client Navigate Life Texas—a website of resources for families of kids with disabilities. It’s a unique site; there’s no other like it in the country. And it serves a huge, growing audience. But because it’s so new, and because the audience it targets is so diverse, a clear hero message was necessary. Hero messages need to be BIG. They need to explain the totality of what your organization does. That can be difficult to do in a compact sentence or two. But to do otherwise—i.e., to publish a hero message that only covers part of your work—is to risk confusing readers and sending away users who’d otherwise find something useful in your services/products. So just be sure to go big or go home(page). For starters, the article emphasized how important Google Analytics can be for determining the angle your hero message should take. If a majority of visitors to your homepage are first-time visitors, the hero message should be explicit and direct—eschewing novelty or cleverness for clear, sober communication with your users. These first-timers need to know, within seconds of your homepage loading, what you do. (Even if you have a large number of returning visitors, it doesn’t hurt to emphasize—again and again and again—what you’re all about. Remember, your users think about your organization about 1/1,000th of the time you spend thinking about you. But even if most of your visitors are returning visitors, it can still be important to fall on the “direct” side. 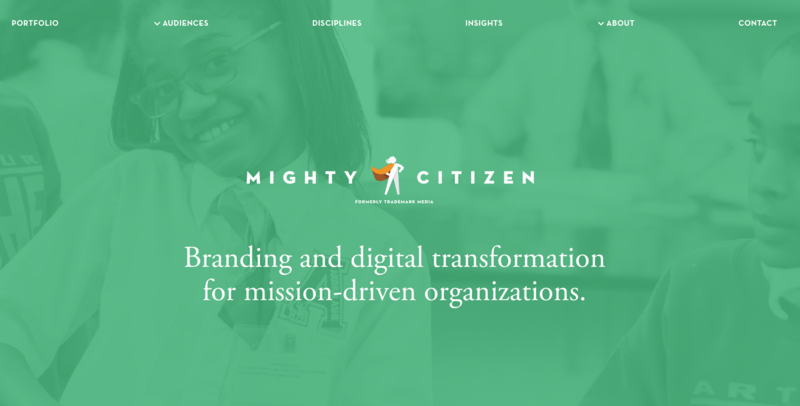 For example, when we re-launched our brand as Mighty Citizen in February 2018, we knew from a review of our analytics that (a) most visitors to our site were first-timers, and (b) we expected most of our initial post-relaunch visitors to be familiar with our previous brand, TradeMark Media, but not with our new focus on mission-driven organizations. Notwithstanding the debatable definition of what “branding” and “digital transformation” means, we think this hero message is spot on. After all, our name—Mighty Citizen—doesn’t make clear what we do, so a hero message is especially important. And it’s why some organizations, whose industry is built into their name, can get away without one. For example, you don’t need a hero message to tell you that. Design trends change. Marketing trends evolve. And who knows—a year from now, I may need to write a rebuttal of this rebuttal article. But I’m convinced that we’ve cleaned up our thinking, simplified it, and made it more attainable for any organization. Step #1: Say what you do/make. Step #2: Say for whom you do it. And voila, you’re done. Remember, your users aren’t remotely as familiar with your brand as you are, and they certainly don’t care as much as you do. They need direct information, not a demonstration of how clever or pun-happy you are. Websites are meant to be problem-solving tools, not talent shows. But with some work, a little panache, and an open mind, you can make your hero message do both. Good luck. See you again a year from now (maybe)!